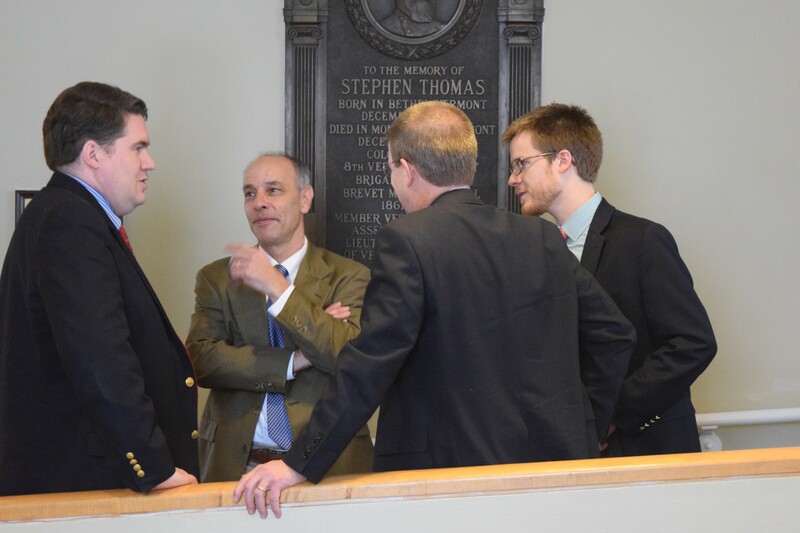 House Speaker Shap Smith (D-Morristown), back to camera, confers Friday afternoon with Reps. Oliver Olsen (I-Londonderry), left, and Adam Greshin (I-Warren) and Smith's aide, Dylan Giambatista. After political maneuvering Friday delayed a vote on an education-spending deal, House members returned to do the deed during a middle-of-the-night session Saturday. The House voted 92-32 at about 1 a.m. to pass a measure that eases the impact of school spending caps that lawmakers had approved last year. Gov. Peter Shumlin planned to sign the bill Saturday, pending a review by his staff. What brought on the odd-hour session? Political muscle-flexing between minority Republicans and majority Democrats. Republicans tried to delay action on a bill they claimed doesn’t contain costs sufficiently, but other than depriving members of a few hours of sleep, Democrats ensured Republicans ultimately had no impact on the outcome. The bill, which the Senate approved Thursday, raises last year’s spending caps by 0.9 percent to account for increases in school districts’ health insurance costs, exempts districts that spend less than the state per-pupil average from penalties for going over the caps and eases penalties for others. The measure removes the caps for 2018, a particular sticking point for House Republicans. Saturday’s unusual post-midnight session, with 124 of the 150 members in attendance, came after Republicans declined to suspend House rules Friday to act on the bill. They argued that they needed more time to absorb how the changes would affect school budgets back home. Democrats countered that school boards needed to know what spending caps to expect no later than Sunday to prepare ballots for March 1 voting. After Democrats twice failed to muster the three-quarters majority needed to suspend rules Friday, House Speaker Shap Smith (D-Morristown) declared the House would reconvene at 12:01 a.m. Saturday. By returning for a new session on a new day, no suspension of rules was needed. Saturday morning’s vote tally suggests that no lawmakers changed their minds in the interim hours. No Democrats voted against the bill.